Last year for Halloween my husband and I dressed up as a zombie and zombie hunter. It was so fun working on our costumes and coming up with the overall look and zombie makeup. My zombie costume was themed as a sorority girl zombie. All great zombie costumes must have a back story, right? Step 2: Start with creating a pale white base layer all over your face. I first used my white cream make-up on a triangle sponge to get a nice coating of white color. I then used my Bare Minerals Mineral Veil over the top of help seal it in. 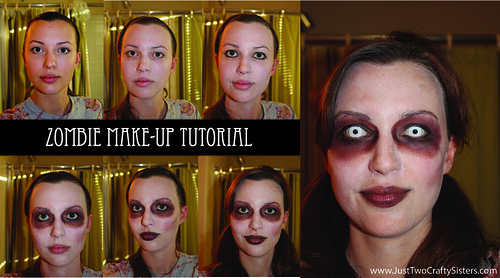 This made it a bit splotchy, so be careful when adding a powder over the greasy Halloween makeup. Step 3: Now on to the eyes. Using a black eyeliner pencil, I did a nice thick line along my top and bottom lids. Next I took my plum color eye shadow (MAC Trax) and using my finger as the applicator I made large purple circles over my eyelids and under my eyes, making both of my eyes look blackened and sunk in. I then used my darker MAC color (Beauty Marked) over the same area to darken it even more. Step 4: To give my face a bit more detail, I used the same eye shadows under my cheek bones. Not sure if they just looked like bruises, but either way I liked the way it brought more appeal and detail to my overly white face. Step 5: And finally on to the lips. Being that I did not want to spend money on a dark lip stick, I went with what I already had on hand. I used the dark MAC Beauty Marked eye shadow on my lips along with some lip gloss and I think it worked great. Step 6: Now on to the final touches. I added a little mascara and worked on my hair. Being that I was a zombie sorority girl, I opted for messy pig tails. 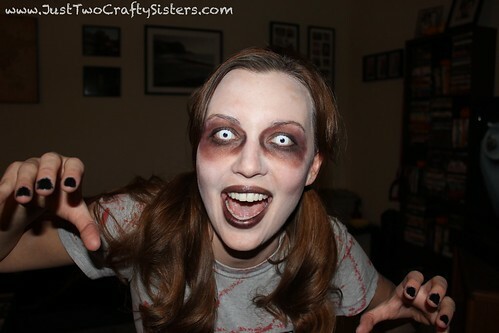 And last but definitely not least, I popped in my amazing white contacts to complete the look. Pretty creepy and oh so fun!